In this article I use (PowerTap hub measurements in loosely controlled outdoor conditions to provide an insight into the performance of the RaptoBike Lowracer. Please note: the test protocol is discussed frankly at the end of the article. 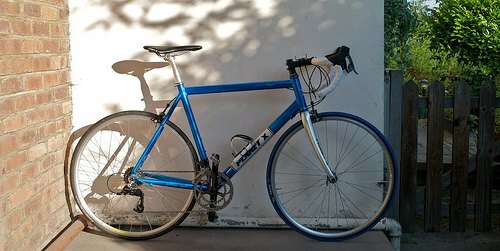 My Planet X Superlight Team road bike, a pretty standard sort of roadie creation, weighing in at around 8kg with SRAM Rival. If I had a fitting, I suspect the bars would come back a little, as I’m quite stretched out (although that should favour the bike’s performance in these sorts of tests). 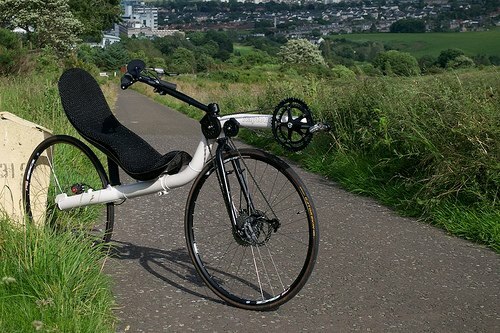 The RaptoBike Midracer, a FWD recumbent that is aimed towards the faster end of the all-round market (it’s not as much of a ‘racer’ on the recumbent spectrum as my DF is, for instance it can carry luggage). The Midracer weighs in at around 13kg. The RaptoBike midracer is significantly faster than the drop-barred bike: 2.5mph faster at 100W, 3.5mph faster at 300W. Even at 150W, the RaptoBike is pulling away at 2.9mph – or to express it another way, 250W on my drop-bar road bike gives around the same speed as 150W on the recumbent. For long distance riding this is a very significant difference. Approximately, you need to burn (and therefore eat!) 540kcal for every hour spent sustaining 150W, whereas you need to burn/eat 900kcal for an hour spent sustaining 250W. (For more on this conversion, I’ve got an upcoming article). is there a lower limit on maximal effort on the recumbent? (personally, riding hard in the recumbent position seems limited by failure of my leg muscles, as opposed to respiratory failure on the upright). I’ve now covered this superficially in a new max effort hill climb article. at submaximal power, is a smaller set of active muscles still subject to earlier fatigue? (see above). Regarding both of the above points: professional riders seem to take it for granted that they may lose 25W between their road and TT position (more than made up by the aero benefit, of course). Couldn’t there be a similar effect in operation during the much larger shift to a recumbent position? Note the major conclusion above: a RaptoBike Midracer at 150W will be going at the same speed as a drop-bar racer at 250W on the flat. Imagine these two riders are racing each other neck-and-neck: the recumbent advantage cancelling out the power advantage of the road bike rider. What happens when they hit a hill? Even at completely equal weight, at 250W versus 150W the upright will climb 1.67x as fast. That’s 16.7mph versus 10mph, leaving the recumbent rider in the dust. The Raptobike adds 5.7% to my kerb weight versus the drop-bar bike, so it will climb 5.7% slower at any given wattage; that is to say, if a given wattage yields 10mph climbing on the DF it will yield 9.46mph on the recumbent. In practice, recumbent riders notoriously experience slower climbing than this calculation would suggest, even when riding with uprights of nominally equal power. Some combination of the factors discussed in ‘caveats’ above will likely explain the difference. I’m looking for indicative results for stock bikes for everyday riders only – this is not intended to be a scientifically defensible test for reasons of practicality (especially given that the bikes are often borrowed from the Laid Back showroom). You’ll notice that the measurements top out at quite a modest 300W. As wattage increases I’m not capable of riding steadily for long enough that I feel comfortable with the errors introduced by factors such as the outdoor location (my one minute critical power is only 650-700W). I’d rather not show any figures than proudly display dodgy ones. Finally, my main interest is ultra-distance riding. If I was measuring bikes for hour record attempts a lot of complications would ensue (how are riding positions optimised, etc). I deliberately didn’t try to equalise the bikes in any way (for instance, by weighting the lighter bike to match the heavier one) to fit with the stated purpose of contrasting ‘stock’ bikes. I wear the same clothing in each test – shorts and short sleeve cycling jersey plus road shoes. Because we’re talking about long distance wattage, I rode the diamond-frame bike only on the hoods, because that’s the way that people ride about in the real world from my own observations. There are ways to make both bikes faster (optimising the riding positions) but again – the purpose of this comparison is the performance of each bike for average riders doing average riding. If you were to go out for 200km on your road bike and stick in the drops the whole time (or use aerobars) then congratulations! You’re more efficient than my reference point! There are many caveats with this sort of thing. First, I’m not doing each run multiple times and averaging the results. The surface is what any cyclist would call ‘flat’ but it won’t be truly 0 degrees level, and while the wind needs to be very still before I head out, it will still be present to some degree. The other biomechanical aspect that’s hard to normalise is your own fitness, in that one’s muscle groups tend to be trained in favour of the recumbent position or the upright position, and it’s difficult to be in top shape for both at once. Following your PBP efforts, have you spent most of the time on the White Fright, for example, or do you feel equally strong no matter which geometry of bike you ride? I feel much weaker in the recumbent position now than I did at PBP, as you’d expect. I got a rude awakening trying the Observatory Rd Strava segment on the Fujin SL…. it will be a long road back before 2015! However, I never managed to feel sick or even really breathless riding the RaptoBike even when I was doing ~200 miles a week on it – I would always just get dead legs. I don’t have rigorous data. Looking back at heart rates over the last few years, there’s a 20 minute all out time-trial effort of 166bpm on the RaptoBike, whereas I can see upright commutes of an hour or more with an average HR of almost 170bpm (and 20 minute efforts with an average fully 10bpm higher than the recumbent). The speeds of these efforts aren’t comparable because I have no memory of wind. For instance, in 2009 I had a day where I came back from Fife in 54:24 for 161bpm on the Touche – probably a gale. The fastest time I can see on Raptobike was about an hour. Thanks for sharing your data and findings. Can you add some more details to get absolute CdA and Crr values from your measurements? The total weight (rider+bike) would be most important. Temperature, elevation, atmospheric pressure would be also interesting. Elevation is basically sea level! 1020hPa (for the nearest observation point, which is ten miles away ), air temp ~12C. You can also pop the PT files into Golden Cheetah and use the Aerolab module. BTW, those data suggest ballpark estimates of your CdA on the Planet X to be around .48 m^2, and your CdA on the Rapto to be around .29 m^2. I’ve measured my own CdA on the brake hoods of a road bike while wearing “touring” clothing at right around .45 m^2, so that will help put that estimate in context. Interesting data, and the results on the flat seem quite reasonable to me, based on my own experience. I’m not sure why you feel compelled to talk about climbing performance, since your results don’t really apply to climbing. And I’m not sure I understand what you are trying to say with the part about the 250 watt road bike leaving the 150 watt recumbent in the dust. 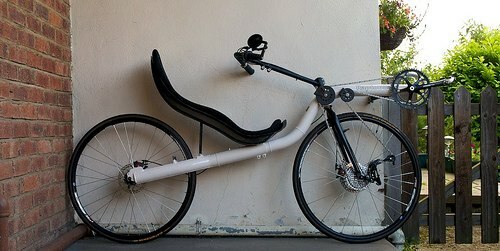 I mean, a 250 watt recumbent would leave a 150 watt roadie in the dust as well, so, who cares? It may well be that the maximal power on a bent is in fact lower than on a road bike, but you don’t have any data to back that up (yet). Why not do such a test rather than guess about it? With regard to drafting. While it’s hard for road bikes to draft bents, it’s easy for bents to draft road bikes, and frankly easier for bents to draft road bikes than for road bikes to draft road bikes. On a road bike, you have to be quite close to the bike in front to get much benefit, and if you let even a relatively small gap develop, you can get dropped. On a bent, being more aero , you don’t have to draft as close, and if a gap develops, you have a better shot at working your way back into the the draft before you are exhausted..
It’s good you had the opportunity to get data that represents your real world riding. The finer details don’t seem to be relevant unless you’re in a lab but sometimes you just need that info to prove your suspicions. As for muscle groups on different machines, ie regular bike vs recumbent, if I ride predominantly one type for a few weeks then jump on the other… oooh! my legs hurt for a few rides. I try to mix it up frequently to stop that but it isn’t always practical. I don’t need science to tell me that though. By the way, how does the Rapto mid compare to the low racer? @Robert – thanks for the link (and the estimate). I’m quite broad shouldered and have sprinter’s legs, so 0.03m^2 over your own CdA sounds perfectly reasonable. There’s clearly a lot to doing these tests properly, although I have had a bash at Golden Cheetah, I think I probably need to read and digest that PDF properly so I’m happy with the underlying thinking. @Eric – I thought it was natural enough to include climbing, because what’s the number 1 thing people talk about in relation to recumbent performance? Unfortunately it’s much harder to experiment with climbing performance because (apart from the weight, which is a small effect and well understood), you can’t easily measure it. It’s certainly possible to draft uprights, but unless you can find people who ride around at 250W to your 150W, you won’t want to stick with them on the flat (and if you do, they’ll vanish up the next hill). Overall, I think this accounts for a large part of the ‘missing advantage’ in events like PBP. This has generated a lot of reading material for me… http://jasperga.blogspot.co.uk/2009/11/chung-method-is-no-joke.html is especially interesting. I think your work has some really useful insights and shed light on many aspects of bike-rider performance. The science can’t easily measure things like ‘discomfort’ for a given output or power, nor is it easy to quantify recumbent- or upright- specific conditioning. My conjecture is that there is a very wide variation among individuals, particularly when it comes to adaptation, so it is also difficult to generalise from small samples. I mention all this because I have been trying to solve the problems of recumbents for a long time (www.cyclingfuture.com). My testing suggests that this concept offers a substantial performance benefit but I need more people to test it out. That is more difficult than it sounds when recumbent riders are few and far between and there are still development issues to sort out. I would be very interested in your thoughts on this idea.